You knew that it had to happen. Here is the recipe (like I really need one) that accompanies the picture. 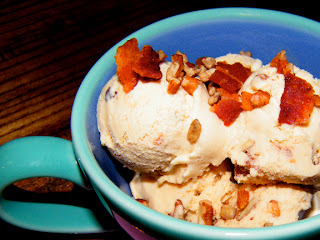 Pretty hard to deny that bacon and ice cream make one heckuva gastronomical dynamic duo. Would you give it a try? I would. I think it sounds wonderful...that salty crunch mixed together with vanilla ice cream. Yummy. Yes, definitely. Sweet and salty...a perfect combination. Oops, I read the link...Not too sure about the human breast milk, but regular ice cream and baon would work for me. bacon and ice cream? Bring it on!!! Bob, Bob, Bob. I couldn't do it. I would try it....not the breast milk ice cream.... but bacon on regular ice cream.